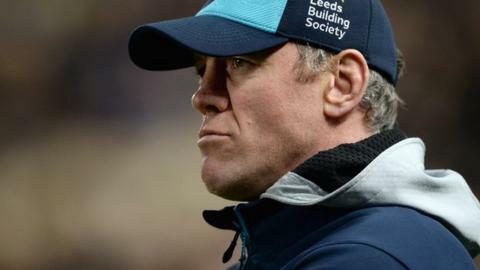 Leeds Rhinos' Brian McDermott has been named Coach of the Year at the 2015 UK Coaching Awards. McDermott led the team to an historic treble as they topped the Super League table before beating Wigan Warriors in the Grand Final as well as claiming the Challenge Cup. England and Great Britain women's hockey team coach Danny Kerry was chosen as the High Performance Coach. England won the European Championship for the first time in 24 years. He has also steered them to Commonwealth silver and achieved Olympic qualification with a 100% win record. McDermott said: "Whenever one person gets recognised for coaching there are so many more people that are part of it. "The whole club here has a part to play in it so personally I am unbelievably proud but I am proud for the whole club because it is a club achievement. "It was a massive season and to see everything come together brought a combination of a few emotions. To pick up all three trophies is still sinking in but I think the emotion at the end was relief." The UK Coaching Awards honoured sports coaches and coaching organisations who have demonstrated outstanding success over the previous 12 months, with British Cycling claiming three gongs. Coaches Richard Shepherd and Andrew Pink walked away with the Coach Developer of the Year and Heather Crouch Young Coach of the Year awards, while British Cycling themselves were named Governing Body of the Year.